The Case for a Child Sized Fridge? 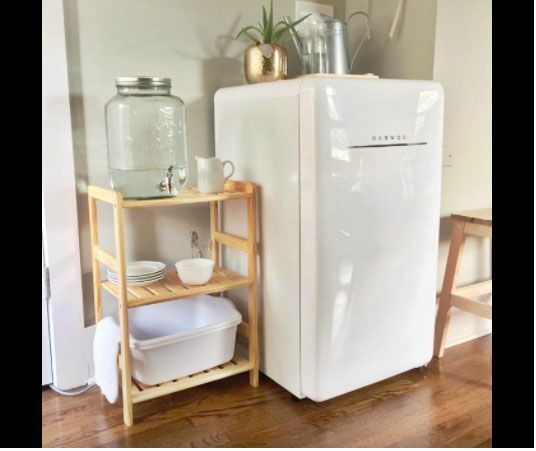 Do you have an old mini fridge sitting in your garage? Or perhaps a small spare fridge that never gets used? Have you thought about putting it somewhere near the kitchen so that your children can use it? Our main fridges have been mostly unaccessible to children. Our fridges have always had the freezer part down the bottom making them totally inaccessible to toddlers and even Otis now at eight needs a step stool to reach most of the shelves. For all of my children having a little child size fridge has been a game changer. It makes our days go smoother, it allows the children to access their food when they want it and it gives them a little place for their own foods. Independent access to snacks - fruit, yoghurt, cheese, spreads, dips, pasta, muffins, fritters, pizza, left overs. Independent access to a cool drink - in summer it's nice to have cool water to drink. Access to milk for breakfast. Ability to put back their snack away when finished. Practical Life Skills - such as opening fridge, collecting pitcher, walking with pitcher, opening snack containers, putting away and cleaning up when finished. Responsibility for their own environment - includes keeping the fridge organised, tidy and clean. Opportunity to participate in putting away their own refrigerated groceries - Otto loves to put his own food away from the market or store. Ability to plan and predict their day - my older children can plan what they will have for snack, if Otis is preparing to bake he will get all of his ingredients together. At a glace the children know what is available to eat. This reduces the amount of times I am asked what we have in the house to eat. Knowledge of what foods require refrigeration or that need to be kept in the freezer. Rather than have all of their food presented to them by an adult our children from toddlerhood learn where their food comes from and how to store and prepare it. Honestly, it's not a chore it becomes a part of life. Otto's snack table is next to the fridge. This makes it really easy for him to prepare his snack or open containers. He doesn't have to carry the food far. In our fridge we currently have banana and blueberry mini muffins, strawberry yoghurt, raspberries, strawberries, oat milk, veggie pots with hummus and advocado cream, apples and oranges (for juicing). Often we will have spreads, sometimes some fruit juice or chocolate milk. We also use a lot of the OXO pop containers, these are air tight but are easy for toddlers to open and close - also a game changer. They keep foods really fresh and Otto loves opening and closing them. It's become convenient to store our water filter in the fridge and at 18 months Otto can easily access and use it. It makes snack time easy peasy! With three children it has been well worth the space and effort of having a child size fridge, but note with toddlers full supervision is required. All of these promote independence and allow the child to have control over themselves and what is happening to them. Even with the youngest child I love the concept of 'doing with' not 'doing to' the child and these independent style of bibs allow the child to participate as much as possible. Bibs also need to be soft and comfortable, not irritating to or rough on the child. Some of these are made of towelling or have a towelling back allowing them to be soft and absorbent. Otto doesn't always like to wear his bib, but will when eating something messier like yoghurt, soup, stews, or pasta when there is a lot of sauce. Otto could take his bib off indpendently at around 8-9 months and he could put it on independently at around 12-13 months. We hang his bib on a low hook near his snack area and at 18 months he can independently get the bib, pull it on, eat his food, take it off and put it away back on the hook. Pictured above Otto is using this bib with an elastic neck. It has toweling on the back so it is thick and can absorb spills. The elastic neck also makes it easy to hang on a low hook. If you are in Australia have a look at these adorable designs for the pull over bib. Freedom Bibs are made in New Zealand by a Montessori parent and look easy to use. Pullover Toddler Bib Tutorial by Blue Susan Makes at Fabric.com. Towel Bib Tutorial at How Does She - making a pull over style bib from a towel! How to sew a baby bib with a pocket at And Sew We Craft - a bib with a velcro side closure. Tutorial and Free PDF Template, The Reversible Pullover Bib by Miestaflet at Fabricworm Blog. Instructions for Tablecloth, Bib, Napkin and Case at the Maria Montessori Institute. Pull-Over Bib Pattern, One Size (6-24 months) at Patterns by Jaykaiy (paid download) on Etsy. What is a Montessori Weaning Set - and how we use it. Why Use An Independent High Chair. My Love For Child-Size Napkins! I love indoor gardening, I cannot get enough of it. But I know not all parents share my enthusiasm. Growing plants indoors can provide wonderful learning opportunties for children. Children can get close to nature no matter the weather, they can observe up close the wonders of plant life. Growing herbs gives the child the opportunity to grow their own food and learn about about real food, real flavours. It also allows the child to reap and harvest frequently. "The most pleasant work for children is not sowing but reaping, a work, we all know, that is no less exacting than the former. It may even be said that it is the harvest which intensifies an interest in sowing. The more one has reaped, the more he experiences the secret fascination of sowing." Maria Montessori in The Discovery of the Child. I've found toddlers in particular love to harvest herbs. Picking the leaves off the plant allows for practice of the pincer grip. For toddlers who can use scissors, harvesting herbs can also provide fine motor, scissor practice! Toddlers can put the herbs in the mortar and pestle to make a pesto, they can tear them into pasta sauce or perhaps chop them for a salad or put on top of pizza, they can sprinkle them over fish or vegetables for roasting. Naming herbs can be a fantastic language excercise and remembering them by scent can challenge the child. We use terracotta pots. I love the asethetics of terracotta but they are porous and allow for more air movement, I've found they work well for herbs. Use quality potting mix, need good drainage. Water every two days. Water slowly and water well. Keep in a sunny position. We use our window sill or on a shelf near a window. (In Brisbane our herbs were on our deck). Our herbs in the UK have survived and even thrived during winter. Remove dead or discoloured leaves as soon as possible. Reduces risk of mould and disease. Harvest frequently. For most herbs this will result in lots of new growth. Pinch out the top of basil plants to promote growth. If the children have watered the plants I will water them again, I usually water them on the kitchen sink and water them until the water comes out the bottom. Most herbs don't do well in soggy soil so drainage is important. As we keep our herbs in sunny positions they dry out pretty quickly and I've not had them suffer from over watering. It's easy to tell if the herbs need more water as they will look a little wilted. If you are worried about over watering, you can leave the watering can or we use a small pitcher inside, full of water and ensure the child/ren know once the water is used up it that's enough (don't refill it until the next day). Or I love the idea some Montessori schools use and put a craft stick in the plant once it has been watered, this will ensure another child doesn't water it again. If you aren't keen on gardening inside or out, how about trying just one pot? "But even one pot with one plant is better than nothing where there is no garden." Susan Mayclin Stephenson in The Joyful Child, Montessori, Global Wisdom for Birth to Three. Toddlers can be rough on herbs, Otto has dropped one or two, he has pulled them out of their pots and often takes off entire branches. Harvesting herbs can teach gentleness, we can teach toddlers to smell and touch even rub their leaves gently. With a little care herbs will survive and can be enjoyed by the whole family!! It's wonderful when a child, especially a toddler, can do their chosen activity independently from start to finish. I recently wrote a little about the snack containers we have been using. Otto (18 months) can open them independently but cannot close them. It's not so much of an issue as sometimes he will use all of the contents or I am close enough to close the containers for him. But it really bugged me. There must be a better solution, there must be airtight containers that toddlers can use independently? I searched and I found that a lot of people with arthritis recommend the OXO POP containers. The OXO POP are known for being easy to open and easy to close. Perhaps they will work for a toddler too? I decided to use an OXO POP container for Otto's play dough. He uses playdough a couple of times a day. We had been using a beeswax wrap for the play dough which is really easy for the toddler to open but when Otto would wrap it up again, it wouldn't be tight enough and the play dough would end up with yucky, dry edges. With the OXO POP the child presses the large centre button and it releases the airlock on the container and the lid can be easily taken off. The button feels like it has a spring in it, Otto really likes just pressing the button up and down, it's super easy to do and it doesn't need much pressure at all. Then it's time to get the play dough out. It takes Otto a few goes to get the lid on properly (aligned and in place) but when he does it's a simple press of the button and the airlock is in place again. Even one handed! After a day Otto had no problem using the OXO POP completely independently. A much younger child would be able to use them too, perhaps from around 14-16 months with a little practice. Otto puts his play dough and his materials back into the little case and back on the shelf. I'm not going to replace all of our containers because it would be such a waste. But for toddlers and high usage containers where an airlock is important, I recommend the OXO POP. I haven't tested the seal with liquids and I don't know how it would last over time, they look and feel strong and robust. From around two to two and half years I found my children were able to open and close simple snap-lock and Sistema type containers. I recommend shopping in store with your toddler if possible and see which containers they can and can't open. One of the main concerns parents have about children accessing their own snack is their ability or lack of ability to self regulate, that the child will eat everything that is available at once. My advice is to start small, perhaps one banana and one orange and allow the child to choose. At eighteen months Otto now has more food options available to him and although it comes slowly, he only snacks when he's hungry and only eats a small selection of what is available. But how do we manage it? Portion control helps. I only put out what I am happy for him to eat. Above, at the start of the day, I clean out, fill or top up his breakfast and snack containers. We use these little jars for spread (jam, hummus, nut butter) so if he eats it all, it's not a problem! I only put out a handful of crackers and breadsticks. All of the granola in the bowl! An older toddler might be able to self regulate further and only get out as much granola as they need, but Otto will use all that is in the container. He doesn't eat it all though, I should reduce the amount of granola in the container. Then if this happens... also not a problem. It's not ideal that he is eating the hummus straight out of the jar, it's for spreading on crackers or eating with bread sticks, so I will role model that later. He can independently open these little lids but can't really put them on tight. Little jars of jam, nut butters and hummus in the children's fridge door. We use a little pot for the yoghurt and sometimes chia pudding. We use a similar method in the kitchen. We put dishwashing liquid in a small squishy (easy to use) bottle for Otto. It's also easy this way to dilute it if the toddler frequently uses too much. Now he can use his own little bottle of dishwashing liquid without the concerns of wastage or large spills. He spends a lot of time at the sink so this is a win-win. We use these little bottles in the bathroom. Again this is also about portion control. By using little containers Otto really can't use too much. They allow him to independently use his bubble bath, soap and, shampoo without wastage or spills. These are all recycled small containers but travel bottles or sample bottles can work well too. Today I'm sharing some new kitchen spaces and a few Montessori cooking ideas. I hope you enjoy!! Above is a breakfast set up! Everything the child needs for breakfast ready to go into the bowl. A no-bake sweet treat made in a Montessori toddler classroom, click through for the recipe. I love it when we focus on what children can do, rather than what they can't. I think this toddler kitchen has it all!!! Does your toddler really need their own kitchen? Perhaps a few shelves are enough!! I can't tell you how much I love this space! I find this space much more practical than a play kitchen DIY/hack. There is a lot of room for storage and a lot of space for chopping and mixing and for ingredients and materials. I adore this kitchen area. So simple and functional!! I'm sure this table is height adjustable and again, there is a lot of bench space for the child to work. I like to have the fridge really close too! This lovely space is in Mexico. A bench with a tub, storage and work space! This post includes images embedded from Instagram. If you cannot view the images please click here for the full post. There are a lot of lists around about Montessori food activities for toddlers, so I wanted to share the activities that we actually did in our home today. It might look like a lot but these are activities that we do throughout the day organically, they aren't put on the shelf in life practical life trays. Some of these activities Otto (17 months) will do in his snack area (pictured above) and some at the kitchen counter, it depends on what we are doing at the time. Anyway, I hope you find this snapshot useful! Picking Herbs - this is a sweet basil variety and Otto is pulling the leaves (gently as possible) off the plant. Whisking Eggs - in preparation for cooking the eggs, be careful with this one, you don't want the toddler licking or eating the raw egg. Peeling an Egg - this is fantastic for fine motor control and teaching the toddler to be gentle. The egg can then be sliced and eaten for snack. Mashing Avocado - we often mash bananas too for muffins. Avocado is so nutrient dense it is an excellent snack on toast or in a sandwich. Along with the mortar and pestle work it's really suited to the toddler as the child can get a little rough and use their strength. Crush Herbs with Mortar and Pestle - Otto loves this!! It requires a little force and makes a bit of noise. Here he is crushing and grinding some basil, add some olive oil and pine nuts and you have pesto! Making Cheese Snack - using cocktail sticks Otto is preparing snack for a friend. Add some crackers or bread sticks (Otto loves little bread sticks) and perhaps some cherry tomatoes and you have a little toddler made platter. This is fantastic fine motor work. We prefer to use cocktail sticks that aren't so sharp, but use what you can. Pulling Apart Garlic - this is a good activity for toddlers who like to rip or pull things apart. It's also good transferring work. Otto also did a little (unprompted) peeling. Peeling a Banana - we go through a lot of bananas so this is an everyday practice. I've cut a banana in two and cut a little slice to allow Otto to peel it. You can see here how I prepared banana peeling previously for Otis. Peeling a Mandarin - this is a fantastic reminder to eat seasonally, the mandarins are fantastic right now. Otto ate five of them straight! Ours are seedless and the segments are so small they don't present a chocking hazard. Otto not only has to peel them but then also to pull them into segments. Delicious! Mixing in Pesto - Otto is mixing our homemade pesto through some pasta. When he is finished we put a beeswax wrap on the bowl and put it in the (children's) fridge until dinner. This is a nice little reminder that food preparation can be real, the very young toddler can make a real contribution to family life and towards a family meal! You may not see it but the child knows the work they have done, imagine how it must feel for a young child to see the family enjoy the food that they've made! Have you seen the new Kitchen Helper at Sprout? It allows young children to safely and independently reach the kitchen counter or sink. One thing I love about the Sprout team is that they do a huge amount of consultation. When designing their Montessori (and Montessori inspired) furniture, they work with Montessori teachers and parents and work and work until the design passes all the tests and meets all the requirements. Which why I think you'll like this design. There are a couple of other reasons why I'll always have a really good look at Sprout furniture. It's made by a company with heart, the products are made in the US and the pieces all just click together (it's genius how well it works). As someone who moves a lot and also moves across continents I appreciate how easy it is to assemble (no screws, no hex keys), disassemble and ship flat packed. The Sprout Kitchen Helper is made from durable baltic birch just like the rest of their Montessori range, it's natural and looks great. The Kitchen Helper is designed for children from 18 months of age, the toddler can climb into the helper themselves (as above) or if the child is a little younger, you can turn the helper around (so the steps are against the cupboard) and you can lift the child in. It's nice and secure, the child can safely access the kitchen bench and make their own snack or help you in the kitchen! It's also height adjustable. I love that it has no screws, is streamlined and compact. Would I have this in my kitchen? Yes! The good news is the Kitchen Helper will be available for pre-order from March 5. I will post a reminder during the pre-order period along with a nice discount, so stay tuned. Sprout are running a give away from now until midnight March 4 (MST US). All you need to do to enter is to click "Get on the List" on the Kitchen Helper product page and sign up for the launch notifications. The giveaway will close and a winner will be chosen right before the pre-order goes live. 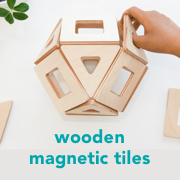 I don't know of any similar products that are made specifically for and with detailed input from the Montessori community. Sprout also ship to the UK and internationally. Shipping prices are calculated at check out. HWM is an affiliate partner with Sprout, we have Sprout furniture in our home and I wouldn't endorse a product that I didn't believe in. Let me know if you have any questions about the Kitchen Helper, and I'll get an answer before the launch. I recently received an email from an Australian parent unable to find the crinkle cutter locally. No matter where you live, these are not easy to find. Look in little independent kitchen stores. It can help if you are able to choose one in person rather than online. Although you may find one type popular online, in person I've seen families use a whole range of different crinkle cutters, there is no one brand that is endorsed or labelled as Montessori. I first used a crinkle cutter with Caspar back in 2011. I received it as part of a pack of practical life materials from Montessori Child. The pack came with little laminated instruction cards and materials for each activity. It was perfect for a first-time parent. Otto has been using a round tipped serrated knife to cut soft things like banana and egg from around 13-14 months. But we will soon introduce the crinkle cutter as a way to cut harder things like root vegetables. The advantage of the crinkle cutter and perhaps why they are so popular is they allow the child to cut with two hands on the cutter, once they learn how to do it, it's quite simple. Crinkle Vegetable Slicer at I Am Montessori. "Loved in our classes so much! " D.Line Crinkle Vegetable Cutter at Kitchen Discounts. D.Line Crinkle Vegetable Cutter at House. D.Line Crinkle Vegetable Cutter at Robins Kitchen. Avanti Crinkle Vegetable Cutter at Kitchen Warehouse. Appetito Crinkle Vegetable Cutter at Victoria's Basement. MSC Wavy Knife at Kitchen Discounts - I have purchased these many times and they are the Joie crinkle cutters. Large Serrated Cutter at The Kid Specialist. We have not tried this one, but I wouldn't hesitate to contact Ruth first if you have any questions. Look in physical kitchen stores, our old local kitchen supply store (at the Belconnen markets) used to stock the Joie wavy knife and lots of other favourite child-sized kitchen items. Other good early/first knives to use in Australia include the Foost First Knife, and Kiddi Kutter. In Australia, there are heaps of options!! Joie Fruit and Vegetable Wavy Chopper Knife at Amazon. MSC International Stainless Steel Crinkle Cutter at Amazon. Wavy Chopper Crinkle-Cut Knife at Montessori Services. Fox Run Vegetable/Cheese Slicer at Amazon. Crinkle Cutter (wavy knife) at Manine Montessori. Crinkle Cutter at Absorbent Minds Montessori. Tala Stainless Steel Crinkle Chip Cutter at Amazon. This is the one I've found most popular with UK families. Faringdon Stainless Steel Crinkle Cutter at Amazon. Atelier Saint-cerf - this is on Etsy and they ship international. We have this one and I was sceptical about using a wooden knife. But it works, just as well as all of our crinkle cutters. This one has the advantage that it is completely compostable and the blade is flat. Although it can't go into the dishwasher. There are a lot of other types of crinkle cutters available, what is important is that the knife works for you and your child. You can see how Otis uses both the black handle and the Joie crinkle cutters at 17 months here. Weekend Montessori Reading - Links to Love! Image credit: My Arka Design. Montessori Kindergarten, Beijing. A new Montessori school in China - this is breathtakingly beautiful - so fresh and light. Found via Cuteandkids. Michels Nursery at 3.5 Years at MontiMinis - this room is so, absolutely, crazy cute, I adore it!! If you love Montessori spaces you must check it out! The Prepared Environment at Creciendo con Montessori (English here). Louis' new playroom at Ondrai et Louis - beautiful and extremely well organised!! 5 Simple winter cooking activities to do with your toddler at Montessori-ish Mom. James in this article is two years old. "The skills a child is building in the kitchen have a direct correlation to academics, even if they’re not in a Montessori classroom." Academics in the Kitchen at baan dek. This looks like fun - The Grimm's Puzzle Square at The Pinay Homeschooler. Facilitates healthy eating and skill development. Is easy for the child to keep clean and tidy. Is purposeful and easy to use. Is as simple and uncluttered as possible. Is practical, logical and ordered, where everything has a place and everything has a purpose. It is important that the space has everything the child needs to complete the task from start to finish. Here is a snapshot of Otto's little kitchen area. This space is mostly for his food preparation for breakfast, snack and lunch. Dinner is always at the main table with the rest of the family and most baking is done with me in the kitchen on the FunPod. Here he will get his snack from the shelves or the little refrigerator and he might slice some bananas or strawberries or eat some yoghurt. He might get some crackers and some dip or spread. The main food preparation he is doing at the moment is slicing, spreading, spooning and pouring. His water dispenser is in the fridge so here he will also get himself a drink of water or milk. Small pitcher of milk - only enough milk for ¾ glass. Refrigerated snacks - oranges, apples, yoghurt, cheese, raspberries, hommus and often small containers of left overs like pasta or treats like banana bread. Snack on shelves - strawberries, banana, mango (often we have avocado) and crackers. The crackers are in an easy open container, at 16 months Otto can open the container but he can't close it. Child size table and chair. Small glasses, bowls, plates. We usually have two of each. Child size cutlery, small serrated knife, mini tongs, spreader. Cleaning basket (black wire basket on floor) - contains water spraybottle, red cleaning cloths, cloth napkins and tea towels (for larger spills). Dust buster. To the right of the white shelves we have Otto's dust buster, which is extremely useful. I only list these to give you some ideas and for me to look back on in the future. Every home will look different and our environments look slightly different every day. Otto shares this space with Otis (7yrs). Otis keeps his snacks and drinks in this refrigerator too. The milk carton in the door is for Otis but the pitcher of milk on the middle shelf is for Otto. Otis uses all of these plates and bowls and it is really convenient for him too. It's working for us now, I'm not sure how we will faclilitate this as Otto gets older. The main concerns I hear from parents is that their child will eat all the food at once and the child will make a mess. Otto is far messier and less ordered than my other children. So I take it much slower with him. For many months he had a choice of three fruits on his snack shelves. No problem if he eats them all at once, but he never did. He didn't have to ask and I didn't have to offer. Now he is able to manage a larger selection of snacks but honestly he still never eats them all. He will sometimes get out the yoghurt and then only eat one spoonful, he has poured the entire pitcher of milk onto the table. But he needs to do this to refine his movements, to learn to listen to his body and hunger cues, and to learn what the expectations of him are and where the limits are. If you start small the mess is manageable. We've recently sized up Otto's pitcher and glasses, it's always important to observe the child and see what is working and what isn't. I can't tell you how much I miss all of these spaces - Montessori Kitchen Areas 18-months to 5 Years. We have exactly 12 months left in the UK so it won't be too long and we'll be preparing new spaces back in Australia! 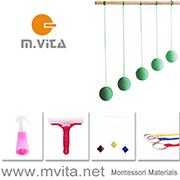 Montessori Practical Life - Slicers at 13-14 months!! I spend so much time in the kitchen I am always looking for ideas to entertain and engage Otto. Our Fun Pod has been a life-saver as it allows Otto to safely work along-side me at the kitchen bench. If he doesn't have something interesting to do he will start grabbing, reaching for things and throwing them on the floor. What I have found most useful is have him prepare his own snack or help me with what I'm doing. I've written a more thorough list here of practical life activities at 12 months, but what I find we do the most is cutting and slicing! While I am cutting up vegetables Otto can spend the entire time slicing mushrooms and putting them in a little bowl or cutting up and then eating strawberries. He is left feeling fufilled (and full) and I have the time I need to prepare dinner in a relaxed and calm way. allows for regular and frequent practice of practical life skills. fantastic use of fine motor skills. meaningful - the child is either preparing their own snack or food for others. it is real work - I know children love cutting and this is preferred over felt or wooden pretend food. it expands vocabulary - without even realising it I have been teaching Otto the names of many fruits and vegetables I wouldn't have otherwise. can expand tastes, likes and, knowledge of foods. it can be collaborative - working together, you cut the mushrooms and I'll cut the carrot, then it all goes into the pot together . practice makes perfect - the more the child does it the better they become at it and the less mess they make. mushrooms - small mushrooms work best at this age, with larger mushrooms Otto needs help. strawberries - I cut the leaves off first. avocado - sliced perfect for putting on toast. fresh Mozzarella - in small balls, perfect for pizza. cucumber - slices for putting in a salad, easier to slice when peeled. Often when Otto (13 months) is cutting with his small knife, he doesn't know when to stop and can cut things until they go mushy. He is able to cut with a small knife but isn't ready to use a crinkle cutter. I put a little piece of non-slip rubber under his chopping board and tray so they don't move while he is using them. The little white tray helps to contain the food/mess. The strawberry slicer (and mushroom slicers) are sharp if you don't feel comfortable them using them try an egg slicer. Supervision is always required. My age recommendations are approximate. If your child isn't interested or isn't engaged in the same activities, put it away and try again later or look for more personally relevant activities for the child. Otis (7 years) and I often look for recipes to make together. We discovered these cute cinnamon rolls but wanted to make them from scratch and we wanted to make them in a more child-friendly mini size. So we adapted a recipe. They were so fun to make and they taste delicious. They were so good I want to share with you! Most cinnamon rolls recipes use yeast, these are easier for children to make (and are foolproof) using self-raising flour. Preheat oven to 180°C and line a cake tin (we use a 24x24cms brownie tin). We use butter to coat tin and line it with parchment paper. Mix dry ingredients for dough including flour, sugar and, cinnamon. Mix wet ingredients for dough including melted butter, egg yolks and, milk. Combine mixtures of dry and wet ingredients and mix until the dough forms. Briefly knead dough on floured bench. Roll dough out into a rectangle. Trim edges so they are straight (make a nice rectangle not an oval shape). Brush the melted butter over the dough. Combine the cinnamon and sugar for the filling, then sprinkle it evenly over the dough. Cut the dough in half to make two smaller rectangles. Roll each rectangle up lengthways, like you are making two long logs. Cut each log into approximately ten evenly sized rolls, mine aren't exact but work out ok! Place rolls into cake pan evenly spaced, side up. Brush rolls with extra milk, not necessary but adds a slight shine. Place pan in oven set at 180°C and bake for 15 minutes. Allow to cool. Use food colouring pen and mini marshmallows to make snail eyes. Cut toothpicks to approximately 4 cm. Place marshmallow eyes on the end of the toothpick. Insert toothpick eyes on the end of the cooled snail. The cinnamon snails can be eaten like this but you can also add icing. We use a simple glacé icing. Place a couple of large spoons of sifted icing sugar in a small bowl. Add warm water slowly while stirring. Combine to make a soft paste texture. Put icing in a small icing bag or make a small bag from parchment paper. Once the cinnamon snail has cooled add icing to snail shell in a small spiral shape. If you don't want to use a bag you could drizzle the icing from a spoon over the cinnamon snail. Step back and admire your snails! These are bite-sized and are very more-ish. Perfect (but sweet) for play-dates, children's parties or just for snack time! If you are making these with a young child or a toddler, you could premake the snails and have the child help you add the eyes - this was Otis' favourite part, besides the eating part! Have your children ever made pickles at school? Mine haven't but it would be a fantastic classroom/practical life activity. It requires lots of chopping and a little bit of peeling and measuring. Making pickles with children is super easy, I'll show you how we do it! 1. First, we select the vegetables we want to pickle! We have chosen vegetables our family likes to eat, we have carrots, cucumber, beans, cabbage and, cauliflower. Beets and onion would work well too. 2. We wash and chop our vegetables. Otis (7 years) loves to use the crinkle cutter and he does most of the work. I chop a few carrots and pieces of cucumber length-ways as I think it looks pretty in the jar that way. 3. We choose which herbs and spices we want to use and put them in the jar. 'Pickling Spices' are available however we like to customize ours depending on the likes of each family member. We have used combinations of chilli flakes, celery seeds, coriander seeds and, fennel seeds. We also use fresh garlic and dill. 4. We pop all the vegetables in a clean jar. Ask the child to tap the jar on the bench to help the vegetables settle down a bit. Otis made two large family jars and three smaller jars for himself, his dad and his older brother. If children want to experiment with vegetables and spices I recommend giving them smaller jars to use, it will minimise waste if they don't like the taste. 5. Pour in the brine. We use half water half vinegar (for these jars we used four cups water/four cups vinegar). We use white wine vinegar and add a little salt and granulated sugar (heat to dissolve). One day I will try apple cider vinegar! We fill the jar, put on the lid and store in the fridge. These are refrigerated pickles only, they will keep in the fridge (if you don't eat them first) for around two months. Or wrap with a bow and give as a gift! They look gorgeous and it's pretty hard to mess it up! How To Quick Pickle Any Vegetable at The Kitchn. How to Make Dill Pickles (with 23 toddlers - optional) at Glue & Glitter. Next week my children are on mid-term break. They have two weeks of school holidays and I can't wait. Otis is currently exploring electrical circuits and Caspar is planning to create some history timelines. Hopefully, there will be lots of nature walks and baking in the mix! Here are a few links and things I've been enjoying this week. As I wrote about school camp earlier in the week, I loved this insight Lower Elementary Overnight... at Villa di Maria Montessori School. This is thought-provoking because it happens in the Montessori world too. Making Exceptions to the Rule at Whole Family Rhythms. Why We Don't Correct a Child in Montessori at baan dek. This is so important! Organic, unisex and nature-themed clothing for kids - I'm loving this range at Stay Bird. Our 2019 Nature Almanac has just arrived, this would make a lovely gift or perhaps for the Christmas stocking! I have a post about Halloween coming next week, but we will be making these awesome frozen yoghurt ghosts from Baking with Kids, perhaps with some child-made yoghurt! Is it possible for children to enjoy a healthy Halloween treat?